I had been wanting a big bulletin board for a while, but hadn’t been able to find one that I thought was both cute AND big enough for serious office work. Over the Christmas break, I came across a $7 bulletin board at Goodwill that seemed to fit the bill. It was big enough: 21 1/2in. x 28 3/4in. 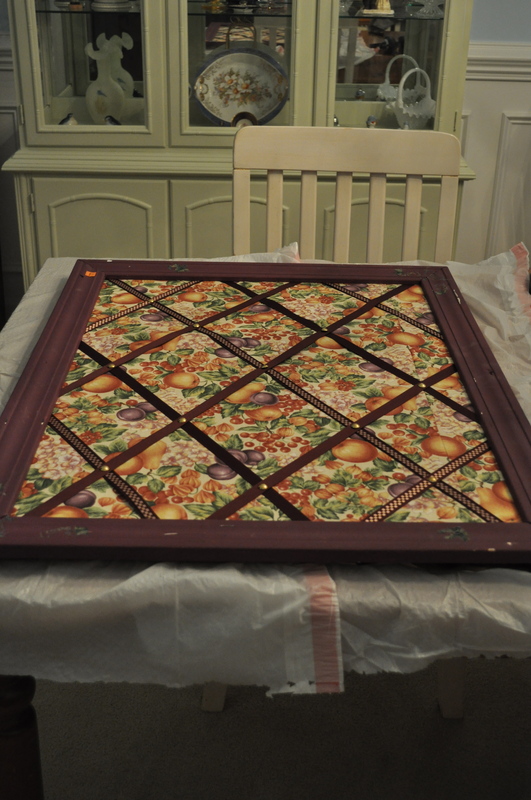 without the frame (26in. x 33 1/4in. 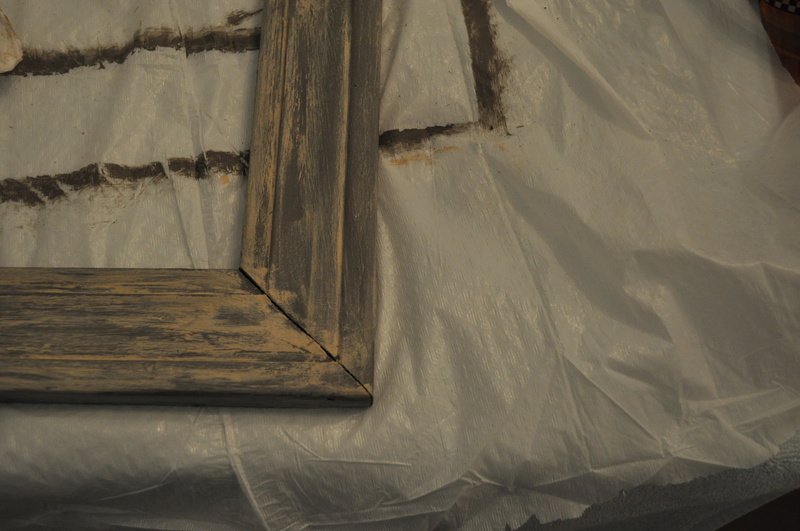 with the frame). The decor wasn’t to my liking, but I figured that even with recovering it, I would save money. 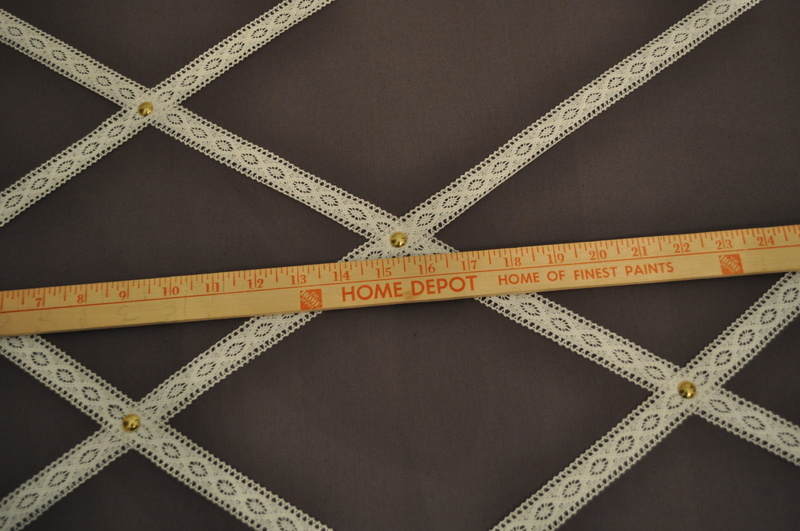 I found some gray/purple fabric for $1.50 a yard. I used white lace, which ran my budget up a little bit. I could have saved about $5 by just using ribbon, but I decided that in the end it was worth it. I added two squeeze bottles of paint for less than $2, bringing the total for the project to $19.50 (plus tax and a few glue sticks). To protect the table, I put a large bath towel underneath the plastic bag. 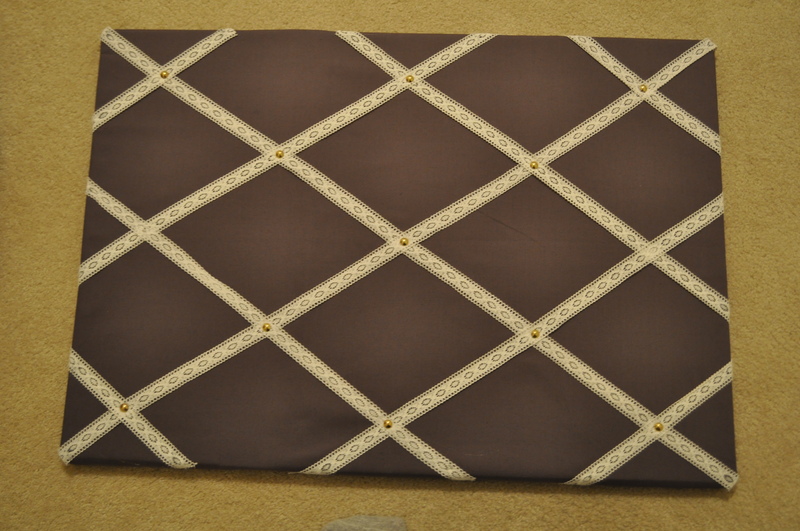 First, I disassembled the bulletin board, saving the pins for this project and the ribbon for a future project. 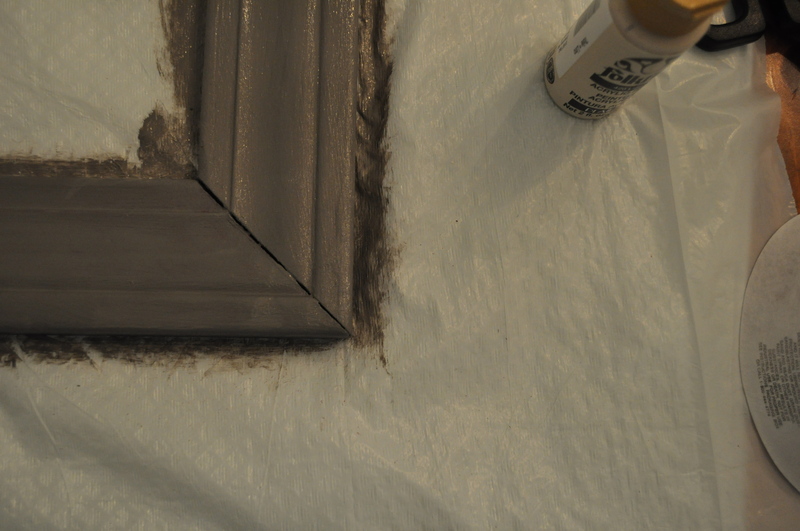 Then, I sanded off the stickers on the frame and applied three coats of gray acrylic paint. 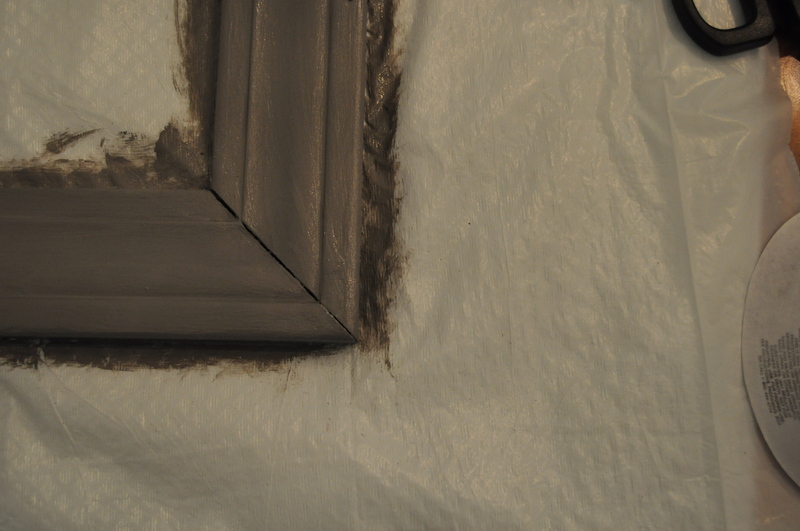 Then, I gave the frame a distressed look by slopping ivory-colored paint over the gray (once the gray had dried, or else the rubbing will pull off the gray) and wiping it off again. 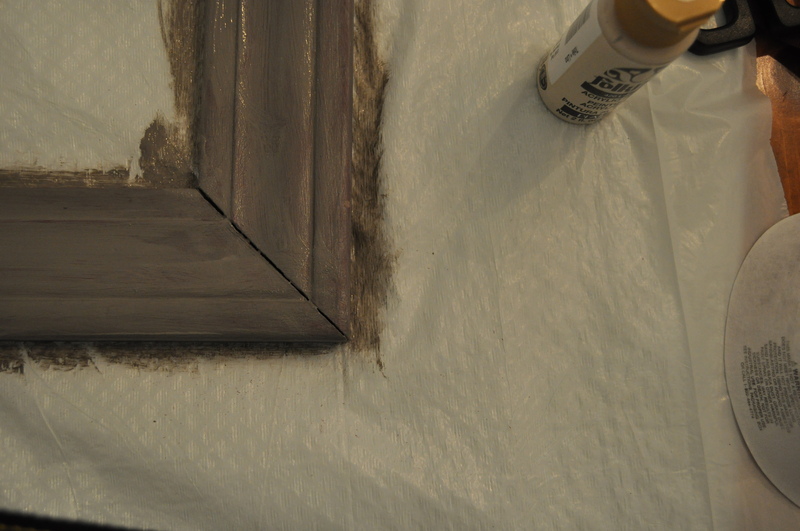 Since acrylic dries pretty fast, I had to do one side at a time, and be very quick about it. The longer I waited, the more ivory paint stayed on the frame. 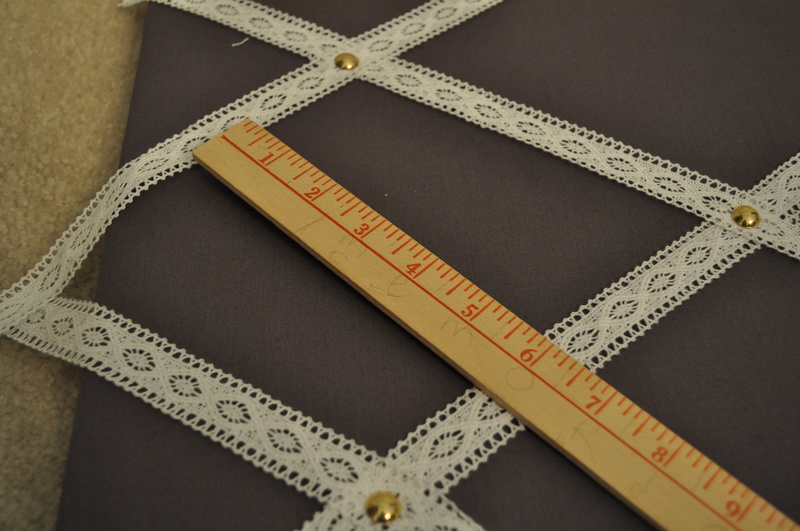 Then I cut the lace as I measured it on the board. 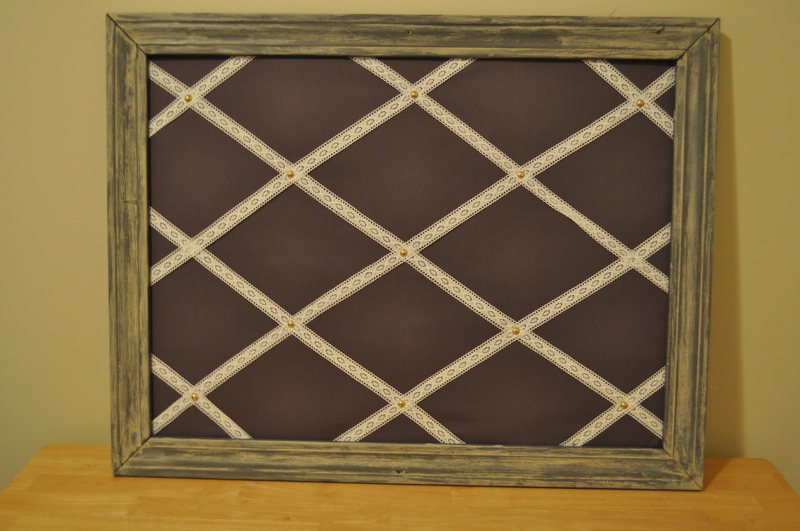 I used 18 feet plus some left over from the headboard project. I first crossed two lengths of lace so that they intersected in the middle and pinned it to make sure I had my starting point. I then added the lengths slanting up from the left, then added the lengths going up from the right. I did not pin or glue anything until I was sure I had symmetrical diamond shapes. 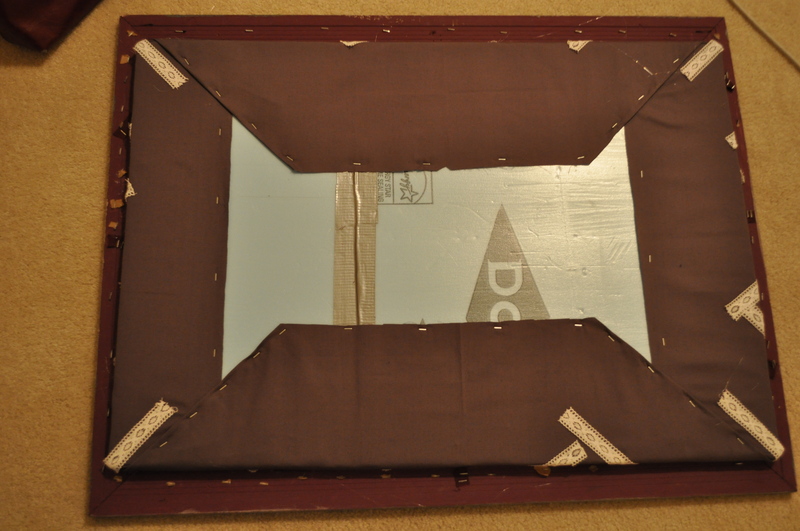 The center intersection was at 15 1/2 inches, so I made sure the one above and below were also at 15 1/2 inches. The middle diamonds intersected on the right and left at 3 1/2 inches. I also measured the distance of the parallel lines and the lengths of the diamonds to make sure they were straight. 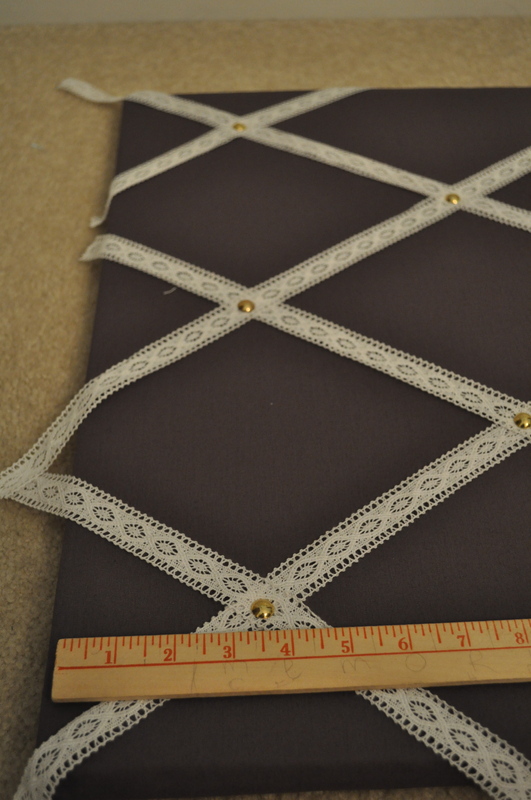 I nearly ran out of lace, so some of the lengths didn’t go over the back of the board. 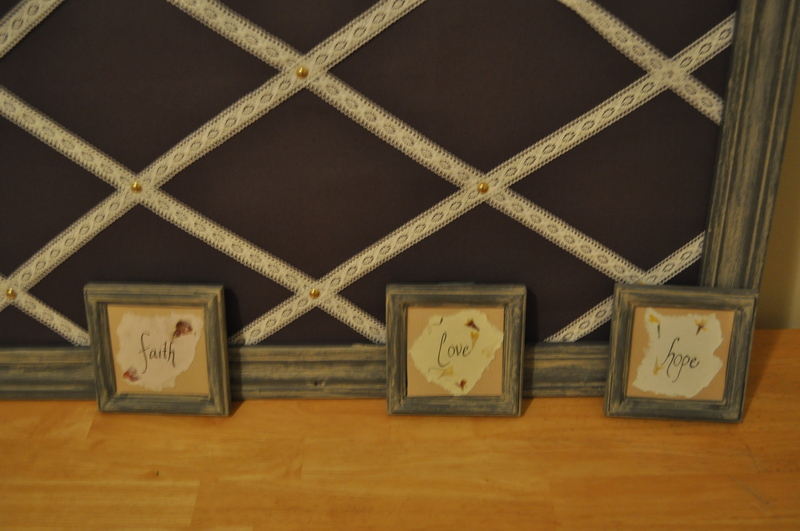 I just glued these close enough to the edge that the frame would cover it. Then, I went hot-glue-gun happy gluing the board back on the frame. 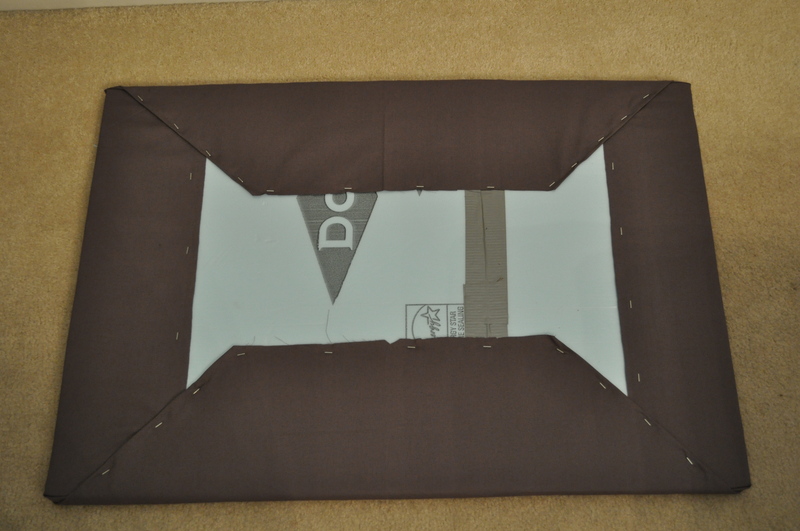 The board came with brown paper stapled to the back of the frame (hence all the staples), but I haven’t added it yet. I turned it over and I was done! 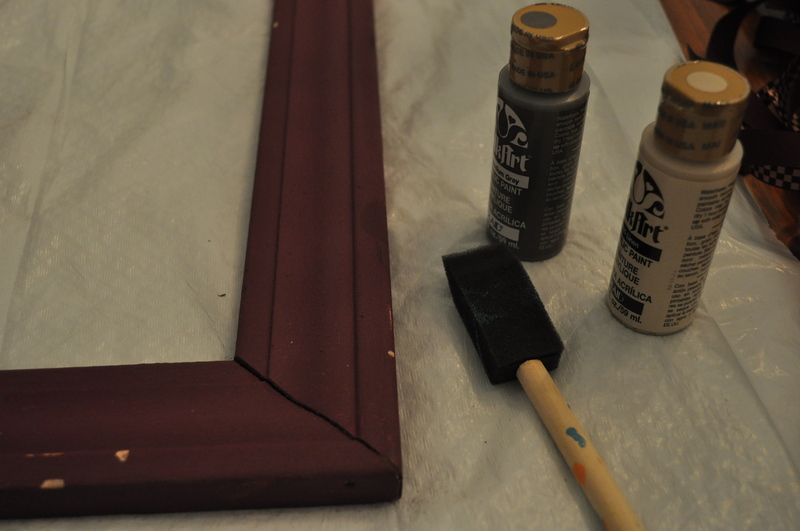 The same weekend, I used the leftover paint on some mirrors that I’d gotten at Goodwill for $2.50. 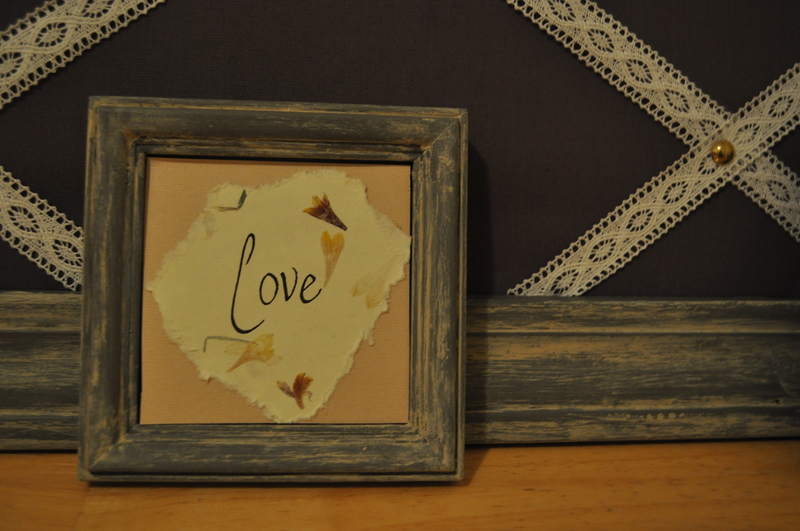 I cut paper to fit in the frame and taped it over the mirror part. 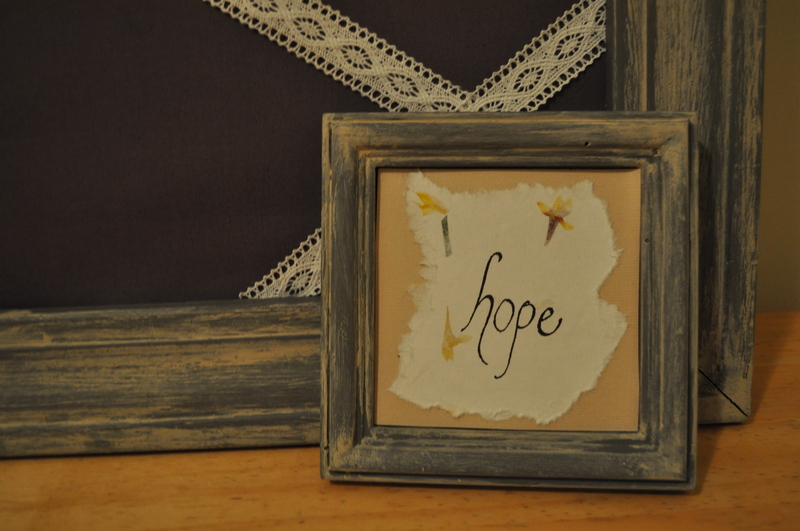 I tore pieces of flower stationary and wrote the trio from 1 Corinthians 13:13: So now faith, hope, and love abide, these three; but the greatest of these is love. 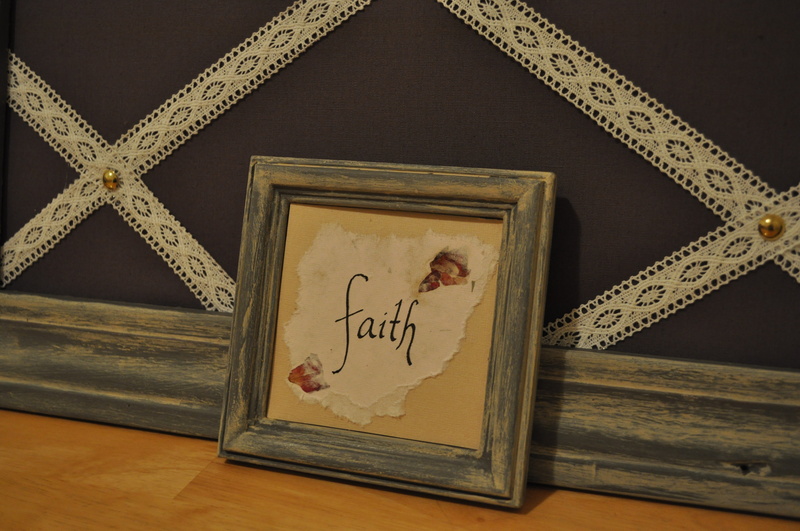 Posted on January 25, 2011 by Katie •	This entry was posted in Decorating!! !, Handcraft. Bookmark the permalink. So cute! I really like the way you did the frame.